Bishopstown Credit Union now has a system that streamlines both our Risk Management & Compliance efforts across the organisation. The CalQRisk application is great, and the continuous improvement cycle which incorporates our feedback is just part of the reason why we continue to use CalQRisk. Bishopstown CU is one of Ireland’s largest credit unions, serving 25,000 members with over €135M in assets – and continues to grow. Founded in 1967, the organisation prides itself on being one of the most progressive and forward-looking credit unions in the country. Bishopstown Credit Union operates in a highly regulated environment. It must comply with many regulations and processes while also being the subject of regular internal audits as well as audits conducted by the Central Bank of Ireland. This puts significant demands on resources – requiring the conducting of continuous risk assessments as well as an ongoing cycle of compliance monitoring. And all of this in addition to the challenges of managing risks to the credit union’s strategic and operational objectives and the continual improvement of process efficiency within the organisation. The tools BCU were using did not satisfy their governance, risk management and compliance ambitions. The effort of generating meaningful and timely reports for the management team was a drain on time resources. Getting meaningful insights from all of their manual processes proved difficult, and BCU became frustrated with the inefficiency of their existing solutions. One of their key concerns was that they didn’t want to maintain two separate systems – be they software or Excel based. 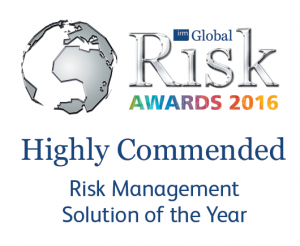 BCU were looking for an integrated approach to both risk management and compliance. They also wanted to involve staff, directors and other volunteers in their risk management and compliance monitoring programme, so an easy-to-use solution was critical. After conducting an initial market analysis, BCU contacted CalQRisk to learn more about its integrated Governance, Risk Management and Compliance solution. Following a system demonstration, it became clear to BCU that CalQRisk could assist them with the management of their risk and compliance monitoring programme. 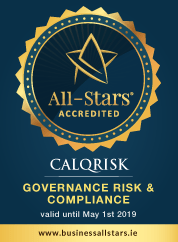 One of the key reasons we chose CalQRisk was that it could act as a ‘Central Point’ for all of our Risk Assessments, Compliance Checks, Incidents, Tasks and so much more. This, along with its dynamic reporting capability, proved to be the key USP for CalQRisk. As part of its customer onboarding process, CalQRisk assigned BCU a dedicated point of contact with whom they could liaise directly regarding implementation, customisation, training and much more. It was important for the credit union that the system was configured correctly from day one and, to that end, their dedicated point of contact spent time working alongside BCU’s Risk Management Officer, Compliance Officer and other key stakeholders to understand exactly how they wanted the system to work for them. In a matter of days CalQRisk was configured in line with their needs and BCU had a ‘live’ risk register as well as an automated compliance monitoring programme which involved key staff and directors. The system was aligned with the objectives and the business needs. Working with Bishopstown Credit Union continues to be a great experience. They continually inform our development roadmap and are a pleasure to deal with. They are maximising the benefits of the completeness CalQRisk brings and are always looking for ways to improve how things are done. Bishopstown Credit Union’s risk and compliance management programmes are now streamlined through CalQRisk and feature live compliance and risk reporting. BCU will continue to experience operational efficiencies through conducting its risk assessments, compliance monitoring and task tracking in CalQRisk. The software is a central repository for BCU’s risk and compliance management information and it gives them the ability to generate and issue meaningful reports at the push of a button. BCU are also using CalQRisk to track and demonstrate their continuous improvement to its relevant regulatory bodies.